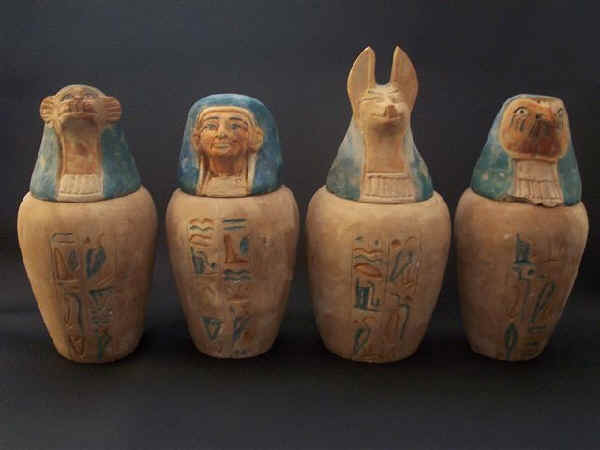 your looking at a Marvelous full set of canopic jars from the Amarna period ,shows on each one book of the dead colored inscriptions,Still in great condition. 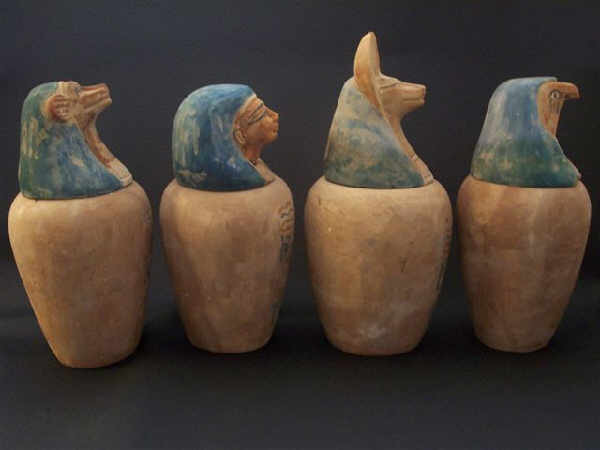 These Canopic jars would have been used as funerary equipment/tomb equipment . 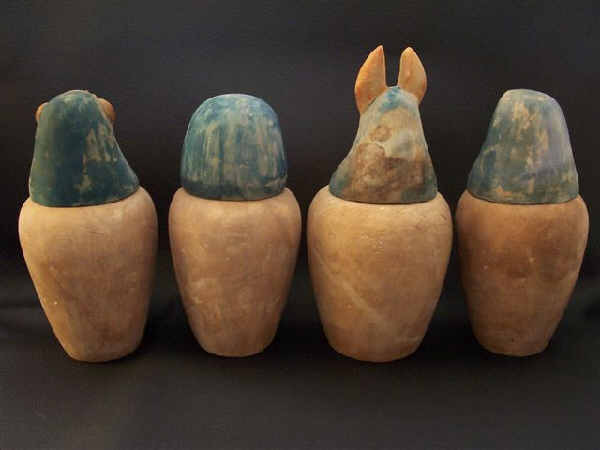 These jars include the 4 sons of Horus. God Hapi the baboon headed god whom was guardian of the lungs, Qubsenuef God and Guardian of the intestines, Duamutef God and Guardian of the Stomach, and lastly Imsety God and protector of the Liver. These jars are carved from stone. During the Nw kingdom, each with an amuletic figure of the relevant deity attached. This is an exciting and rare auction. Donot miss out. purchased from An antique dealer. Imsety jar tall: 19 cm ( 7 1/2 inch) x circumference 30.5 cm(12 inch) Qebekh-sennuef: 19.7 cm ( 7 3/4 inch) x circumference 30.7 cm(12 1/8 inch). Hapy jar: 20.3 cm ( 8 inch)x circumference 31.5 cm(12 3/8 inch). Duamutef jar: 23.2 cm ( 9 1/8 inch)x circumference 33.7 cm(13 1/4 inch). Appearance Dating ---> 1323 BC-1295 BC. I obtain my items from various sources (antique dealers some of those dealers have been working in this business since 1930's and 1940's) private collections and or estates), We have received all information regarding our items from second hand sources, and the timeline set on our items is to be used as a guideline for the above period listed. Since I am a collector myself I tend to take pride in the items I aquire. These pieces are wonderful and we present them as they have been represented to us.